More than just recipes here. Preparing gluten-free, grain free and anti-inflammatory recipes at home becomes essential if we are to control what goes in our bodies. Creating non allergen recipes may take some time, effort and trial and error, yet the rewards are great. Some of the recipes are considered "therapeutic", like the bone broth and liver tonics, while others are alternatives I have created over the years to replace traditional recipes, like gluten free and grain free breads and cookies. Click the category you are interested in to quickly jump right to that section of the page, OR just scroll down the article. 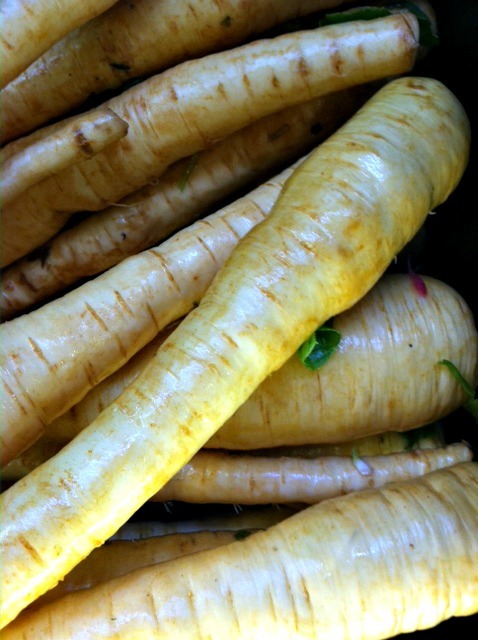 Peel and cut organic parsnips, add sea salt and clarified butter(ghee) or olive oil and bake @375 in covered glass baking dish. Easy to digest, gluten-free recipe and acceptable on anti- inflammatory diets. And yes, they taste great !! This salad is a great subsitiute for potato salad, pasta salad, etc..great for summer, gluten free recipe, and the taste is devine. 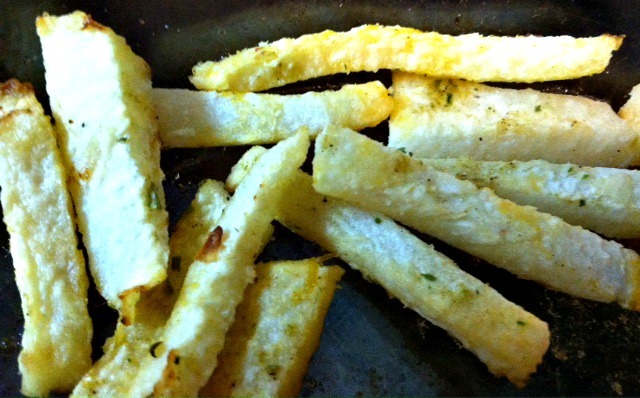 When it's cold outside and you want an alternative to French fries. Slice raw jicama in uniform pieces. 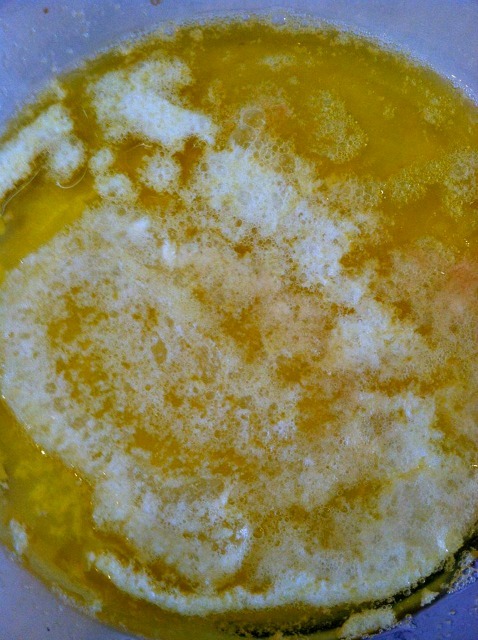 Cover with a light coating of coconut oil, clarified butter, etc. and sea salt. Bake at 350-400, depending on your oven, until lightly browned. Ever had WHITE sweet potato? I picked up some beautiful organic white sweets at the market the other day. 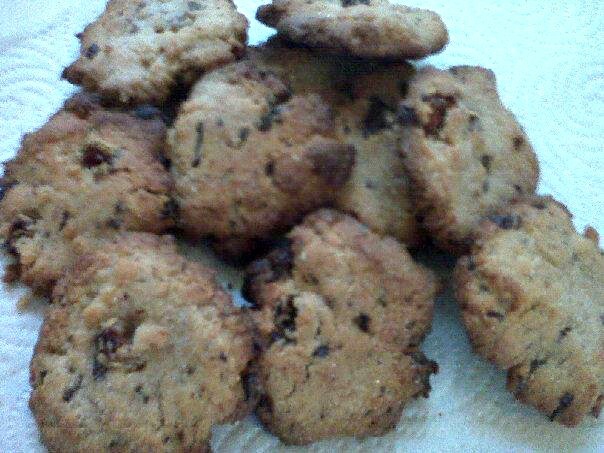 Here I baked them and then added some ghee, flax meal and pecan pieces. Do they taste like sweet potatoes? Well, yes only slightly less sweet but with more starch. 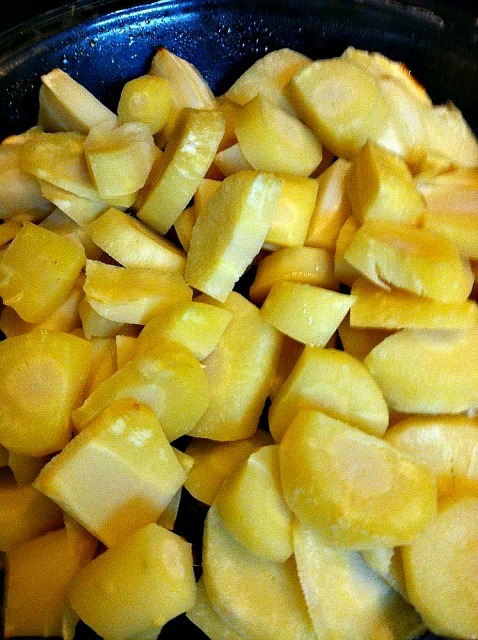 White sweet potatoes are best eaten without animal protein for better digestion. Well, yes only slightly less sweet. Don't you love the smell of healthy, aromatic food? 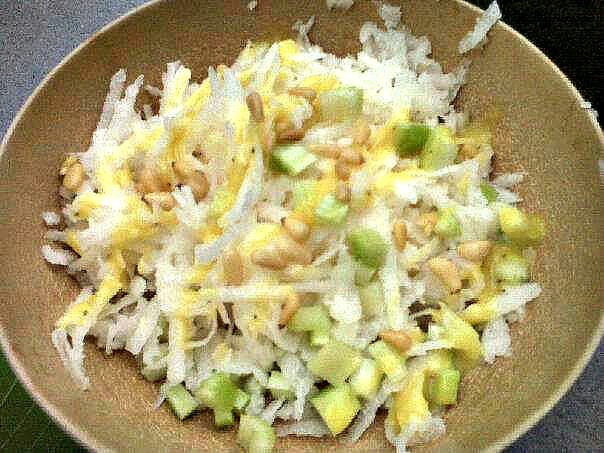 I finely shred raw jicama, adding both yellow and green onion(diced), sea salt, coconut aminos, red pepper, garlic and coconut oil. Can be eaten raw or heated in oven. When heating, I use a large glass pan, uncovered at about 350 until lightly browned. Top with eggs or shredded beef for a delicious gluten-free recipe entree. 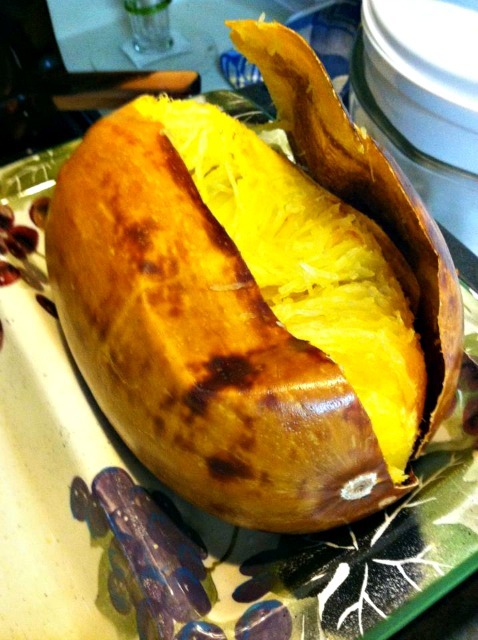 When cooking a spaghetti squash, always cook WHOLE to seal in the flavor. Just put about 8-10 slits in the squash with a knife, and put in oven at about 350, for 30-45 minutes depending on size. Cutting squash in half before cooking is just not necessary, it loses flavor AND can be hard on people with arthritis or fibro in their hands anyway. I GARE-ON-TEE it's easy and taste is amazing. Be creative when seasoning, so many varieties !! That's what I'm talkin' about !! See, without the wheels(the egg yolks) the bike wont be going anywhere..
As I always say, avoid creating an imbalance by eating egg whites alone. Always "eat your yolks folks". The benefits are a page long, and for most people with egg allergy, its the white, not the yolk. And, use in gluten-free recipes. The white alone is very acid forming as well ..
Use the best organic and/or free range eggs whenever possible. I BAKE the RED potatoes but not fully, we want them somewhat firm. 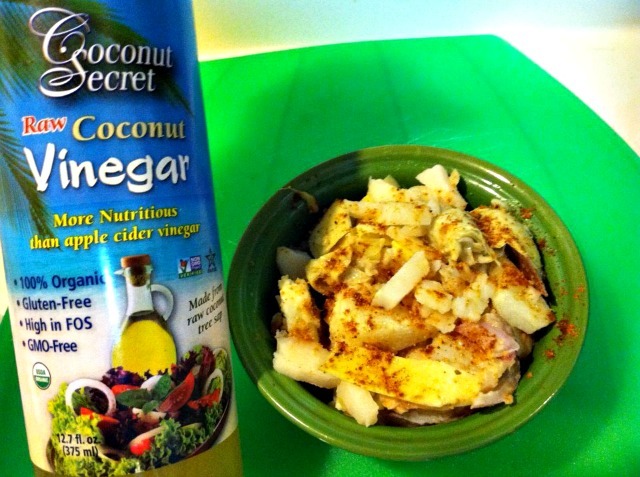 This heal-thy vinegar can be used in all diets even RAW diets. And the taste is similar to ACV, yet better and slightly milder. CCV is a gentle cleanser for the system as well. In fact, for a cleansing drink, add 1 tsp. CCV and a dash of cayenne pepper to 16 oz of water. Eggs can be an excellent food but they must be eaten whole to create balance. Never discard yolks, they are natures finest fats. Cook lightly to preserve the integrity, hard boiling is not the best. 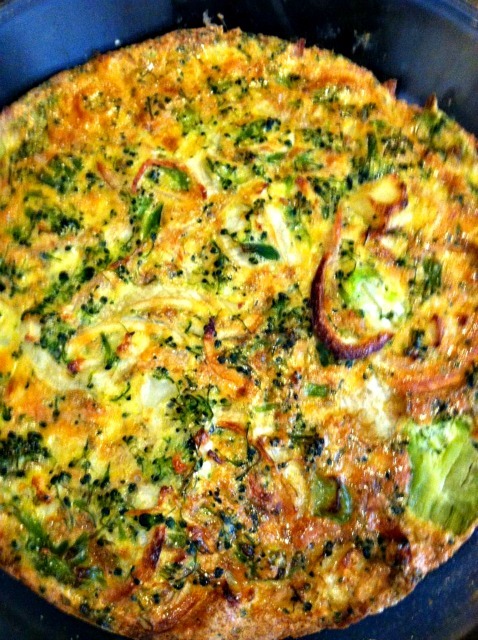 And always eat with vegetables such as this omelette I made with two organic eggs, onions, broccoli , coconut oil. Quality eggs raise 'happy' cholesterol and are excellent for thyroid. They are a contracting food so best eaten in the afternoon. Having trouble digesting eggs ? Remember that the white is the more contracting and acid forming part of the egg. Use less of the white if needed and add extra liquid. 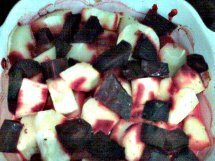 All Organic ..Parsnips, turnips and beets .., peeled and cut, add a tbsp. of raw oil or butter and sea salt, bake at 350 for about 40 minutes in covered glass pot or baking dish. The taste and presentation is devine. One of my tasty grain free, sugar free, AND gluten-free recipe options. 4 tsp. Unsweetened organic cocoa powder. 1 tsp. Flax or pumpkin meal. 5-10 drops liquid stevia of choice. A shake of sea salt. 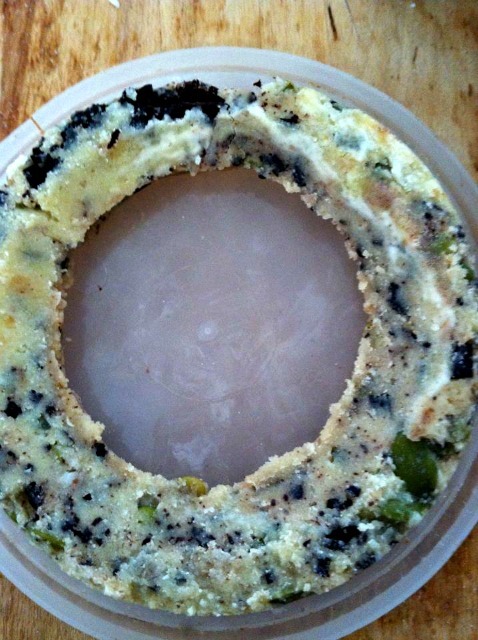 Mix all together and spread as thin as you like in the bottom of a freezer safe container. Put in freezer. It doesn't actually freeze, it simply MOLDS and sets for YOUR eating pleasure !! 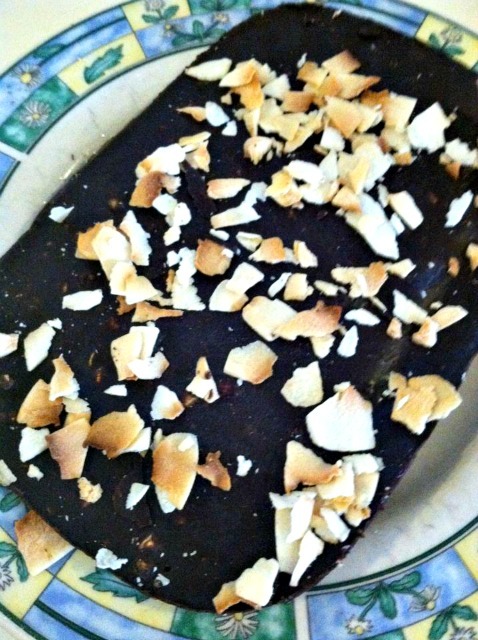 I added some organic (must be sulfite free) lightly toasted coconut flakes. For variety, I like to make my coconut oil bars in various shapes. Here I molded the mixture into round containers to form circular bars. 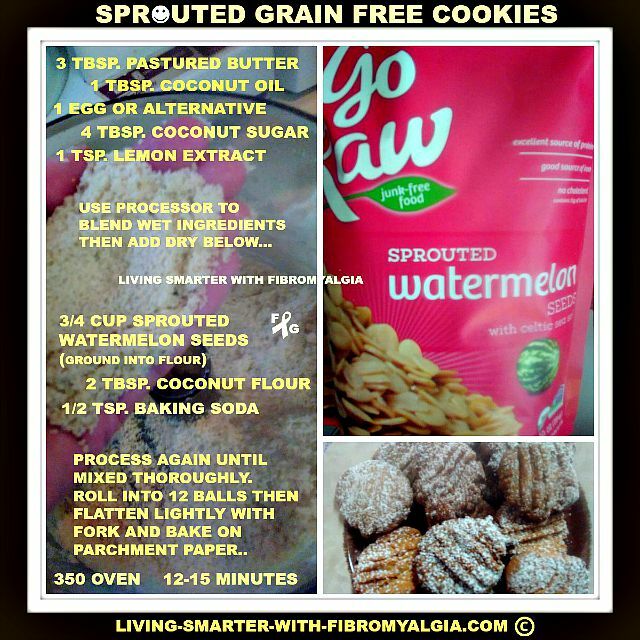 Grain free, gluten-free recipe for great tasting energy source !! 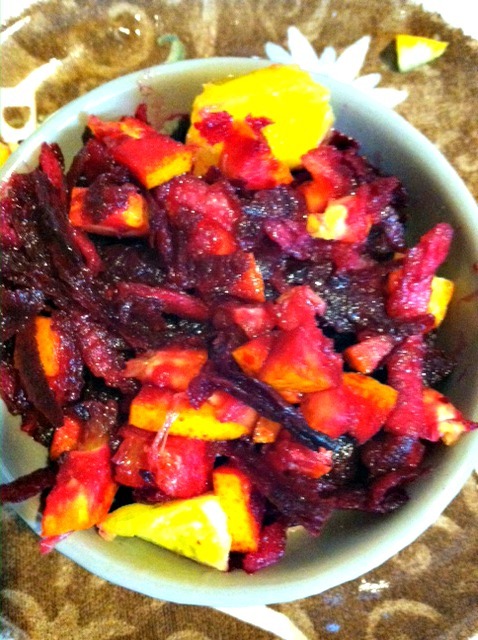 Shred the peeled beet into a good sized bowl for working. Add in coconut flakes and shreds first to 'coat' with the red juice from the beet. After mixing, the coconut should be a nice red color. Add in rest of ingredients except the creamed coconut and blend well. Form the macaroons into balls and blend a small piece of creamed coconut into the center of each one. Flatten the macaroons slightly for more even cooking. 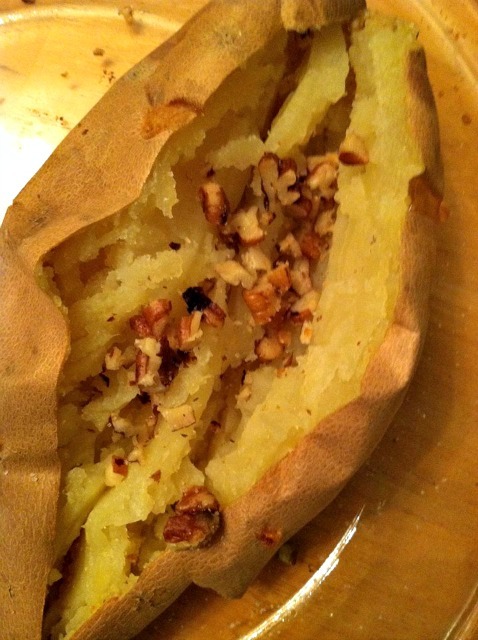 Bake at 325-350 for about 20 minutes (depending on your oven)….. a light brown only. 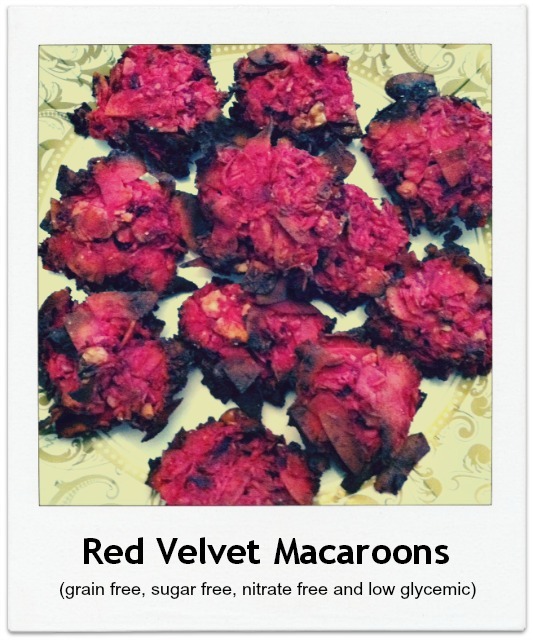 Depending on size, this recipe yields about 16 small macaroons. 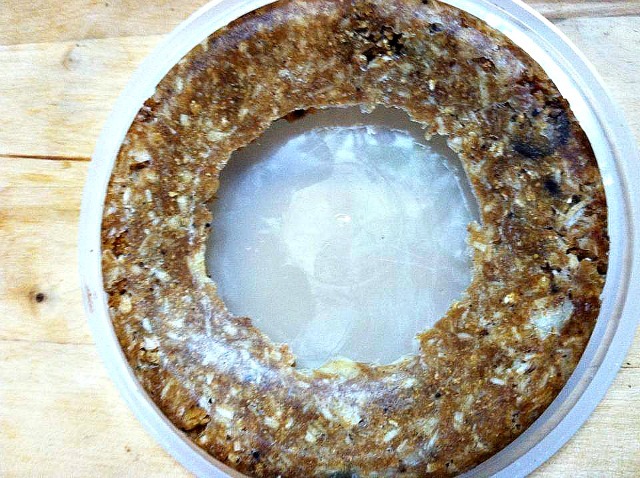 Mold in THIN layer on bottom of circular freezer safe containers..
Yummo !! One of my favorite coconut oil bar flavors!!!!! Very simple, I dont use any eggs in this recipe, the butter holds it all together and amounts can be varied as well. Gluten-free recipe of course. 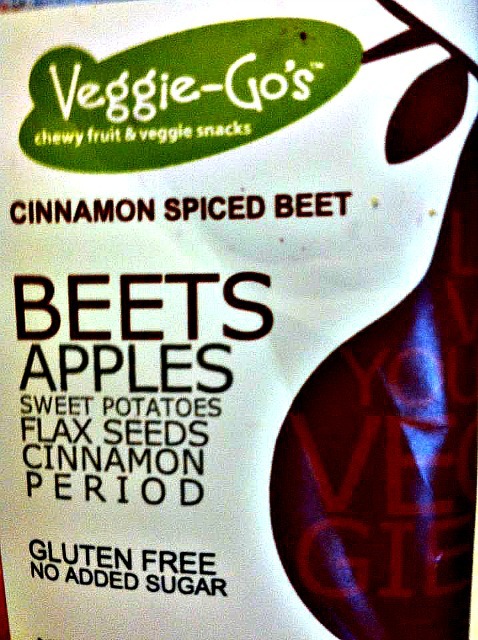 Made with beets, apples, sweet potato, cinnamon, flax, etc. They taste amazing for a mere 15 calories per serving . Veggie-Gos, check them out and add them to your grain and gluten free recipes today !! Add the olive oil and salt and blend well with a fork. This recipe is good for about 4 servings. 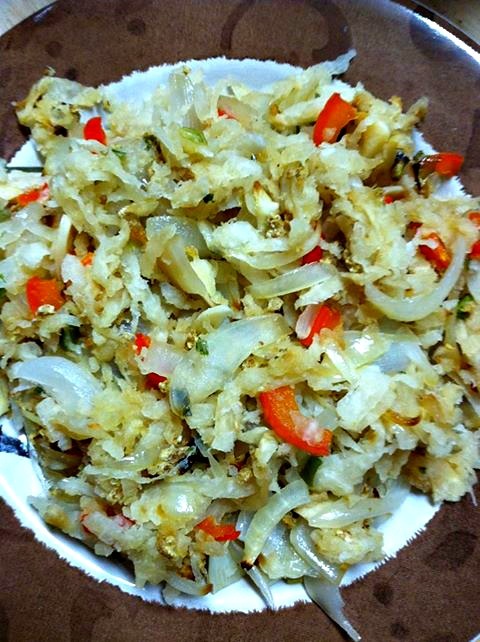 For more on Iron Rich Foods, click on Iron Rich Food link in the recipe title. 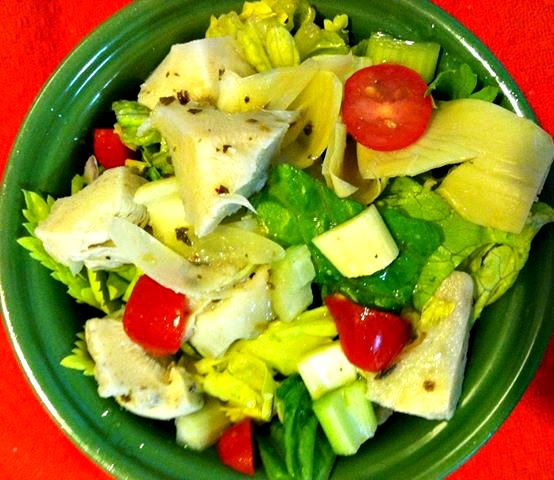 I love the tender, sweet hearts of artichoke, celery and romaine. Together they make a delicious salad. Tri-heart salad.. love, love, love it. I finely cut/dice all three (don't forget the celery leaves) add in some sliced grape tomatoes and vinaigrette type dressing. Just another way to mix it up and create variety. 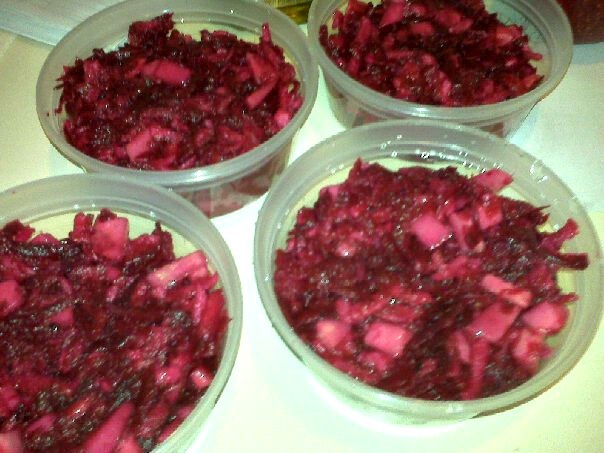 Shred the beets and apples, cut radish, then add olive oil and sea salt if desired. All of these ingredients are gentle, effective bile movers...from nature...note: I shred the beets and apples, and cut the radish into pieces, add just a small amount of olive oil and sea salt. 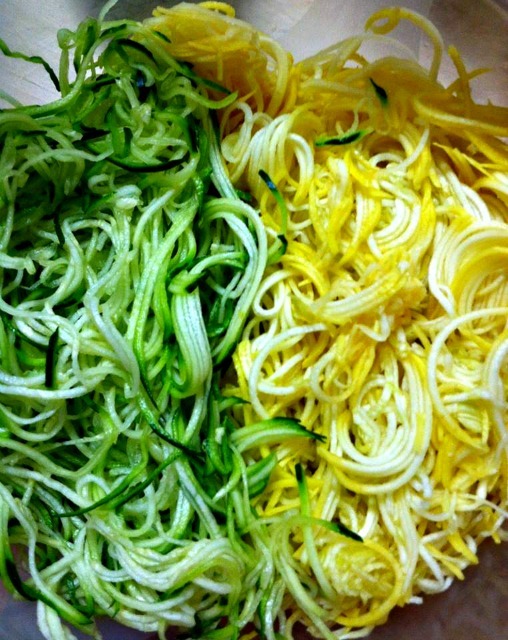 I spiraled both organic raw zucchini AND organic yellow crookneck squash. I made them into "angel hair" using the saladaco. If you don't have a saladaco, check out our Kitchen Tools article page on the Navigation Bar. This is an inexpensive and valuable tool. 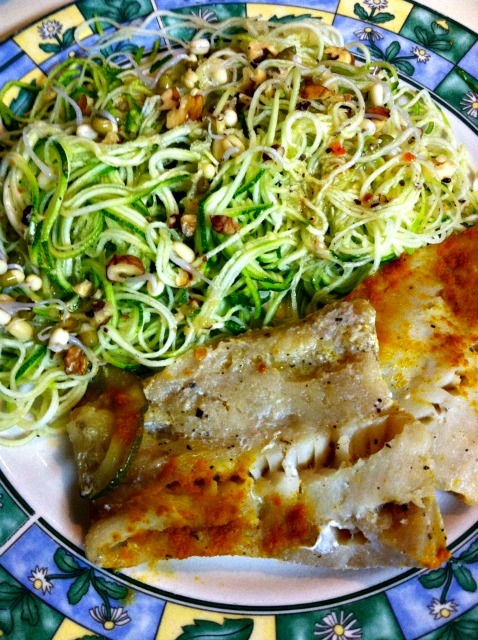 Different than just shredding or slicing, it gives the zucchini/yellow squash a more palatable taste and texture. Everything is enclosed unlike a shredder box or cutting board for added safety. My favorite way to dress it is with a thai ginger, mustard dressing or pasta sauce yet the variety is endless when it comes to additions to zucchi. Many people say they don't miss regular pasta after this. And, gluten-free recipe of course. 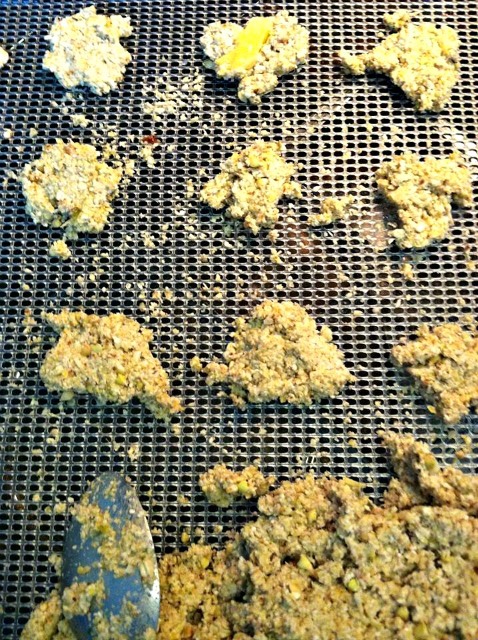 using both raw and cooked ingredients..
Soaked and spouted raw/organic buckwheat kernels. Sea salt, italian dressing of choice. 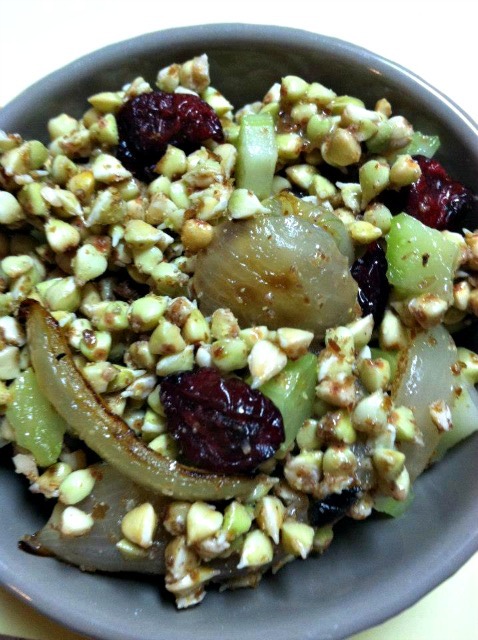 Note: I do not always give specific amounts of ingredients where they can be varied to taste or serving amount in recipes such as this one ..
More celery ..less cranberries ...whatever works .. 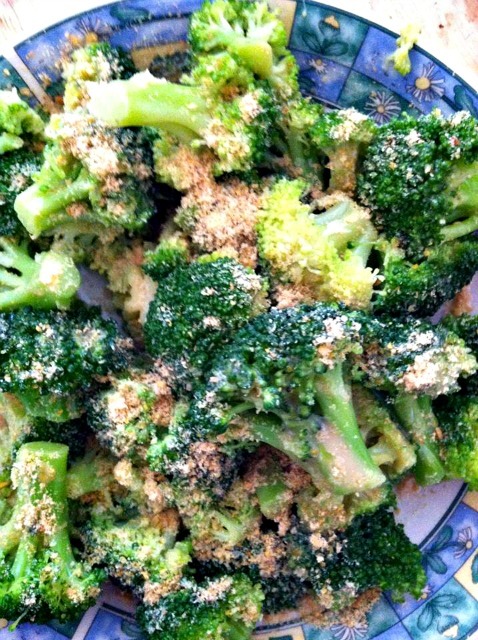 Broccoli with Annie's lite honey mustard, flax meal and sea salt. I take organic raw crookneck squash and slice thin lengthwise. Use any way you would normally use thin sliced pickles. Stack on a turkey or grass fed meat burger or in salads. A great way to create more color and variety!! And, for gluten-free recipes. 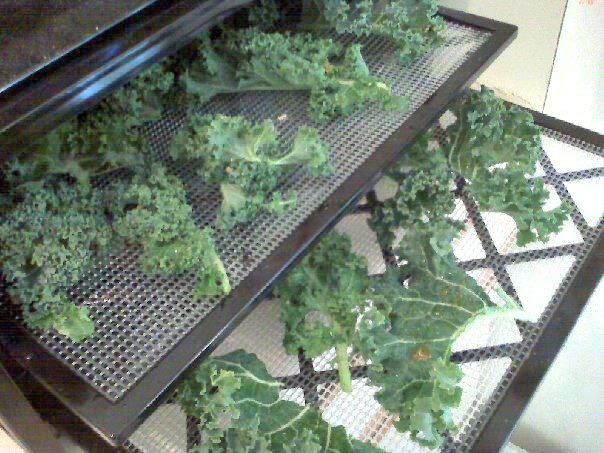 Dehydrating kale, to make RAW kale chips ..add sea salt or other spices. Limit kale if thyroid symptoms are present. However, with adequate minerals like selenium and zinc, greens can be consumed in moderation. Grain Free, Gluten-Free Recipe Option ...."Buckies"
What I call 'Buckies' , I'm dehydrating trays of soaked and sprouted buckwheat. I use these in my raw coconut oil bars and as a grain free cereal with organic coconut shreds and currants. 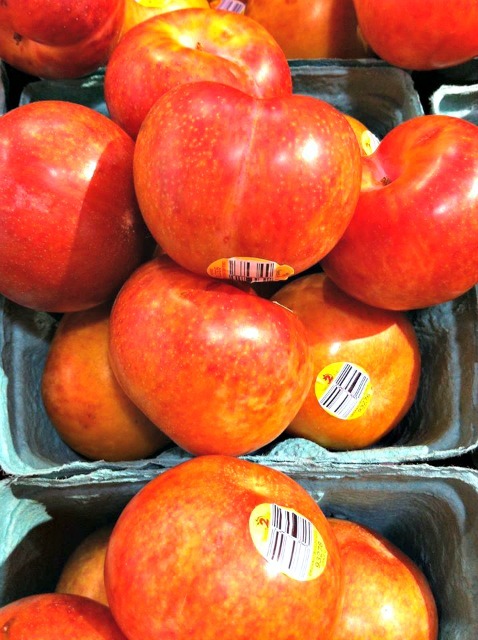 Health effective AND cost effective this way ..
A cross between a plum and apricot. I picked up some organic pluots at the market this evening. Good stuff. They taste amazing. Slightly sweet but small in size and calories. A perfect addition to any blender drink OR as a snack. A little goes a long way so use them sparingly and buy organic when possible. The ORGANIC brazils are not only healthier but taste so much better as well !! I buy in bulk at Whole Foods stores or farmers markets. Just one part of my heal-thy gallbladder tonic. Supports healthy bile, liver and gallbladder. Take 1-2 times per day on empty stomach or whenever you wish. Blend on high power and drink away. 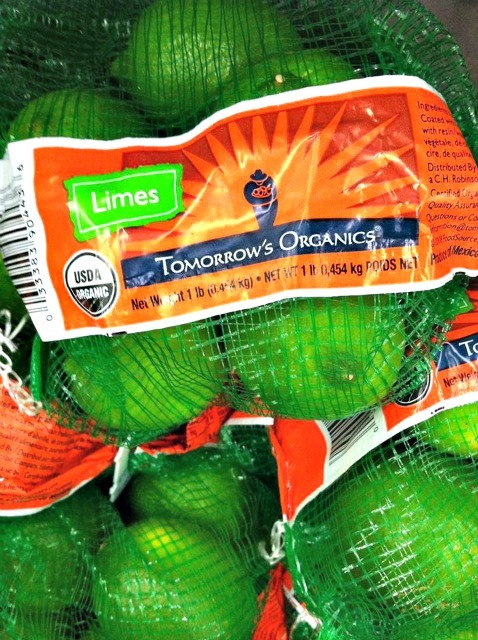 The lime and green apple lend a great taste. 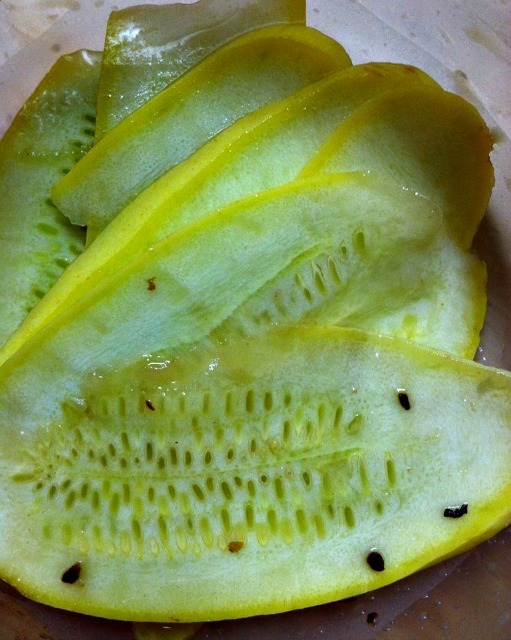 The malic acid in green apples is great for your fibro and low glycemic. Free flowing bile is essential when dealing with ANY chronic illness. Inefficient gallbladder OR bile congestion? Healthy bile flow greatly determines pain levels in the body, digestion AND critical absorption of nutrients. Green apples are high in malic acid, excellent for Fibro AND the liver. Organic olive oil is also great for increasing bile flow. 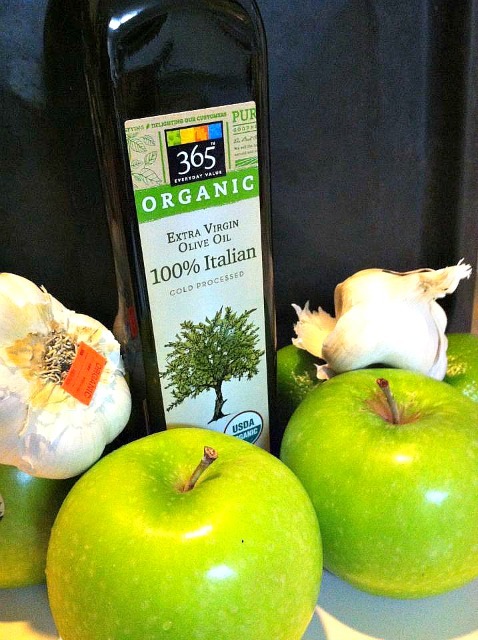 For a heal-thy tonic, juice the green apple, add some raw olive oil and chase with water. Do this as needed. Add garlic and ginger root for extra benefit. This is just one easy gluten-free recipe that I have used with clients for years. Best done on an empty stomach and perfect for those with citrus histamine allergy. Without a gallbladder ? Still essential to cleanse those bile ducts. Do you make your own ghee (clarified butter) at home ? Because the structure of gluten and casein (dairy protein) are so similiar, it's good to use both casein free and gluten-free recipes. Ghee supports celiac, leaky gut, healthy gut lining, joint and bone issues. Here, I heated a block of organic butter at 250 in a glass pan in oven for about 30 minutes. Pour off the golden liquid, leaving behind the white portion, that is the protein, casein we do not want. Store in glass jars. Use acceptable ball jars and freeze as well. Gluten-free. I use a separate coffee grinder for seeds. 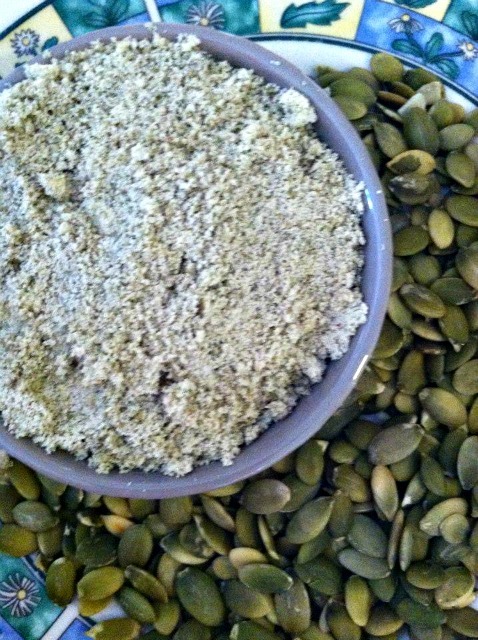 Organic pumpkin seeds are good for the bladder, prostate and gallbladder. Use on salads or in recipes. HIGH in zinc and great for the endocrine system. Do you prefer your flax seeds blonde OR brunette? I buy both and mix them. They seem to get along pretty well together!! And, they're for gluten-free recipes. I use a designated coffee grinder for grinding all of my seeds. For seeds and all nuts, I either soak or grind before using. So many uses for coconut aminos. I like to use them on grass fed steak and vegetable stir fry. THE best alternative to soy or steak sauce ..
Pictured here with pumpkin seeds and sprouted buckwheat. 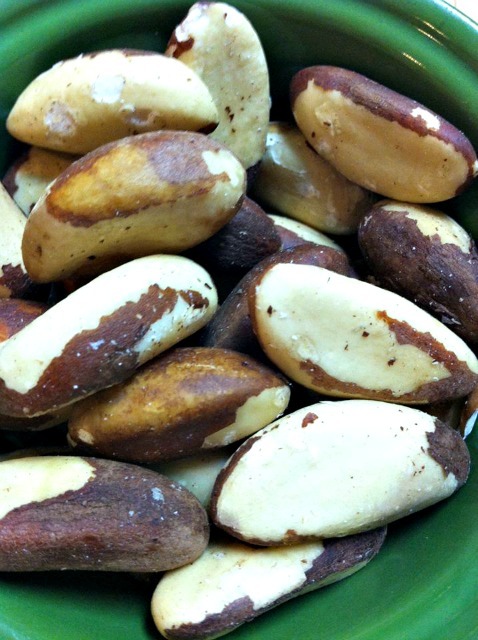 A great and nutritious alternative for those truly allergic to nuts AND for variety. 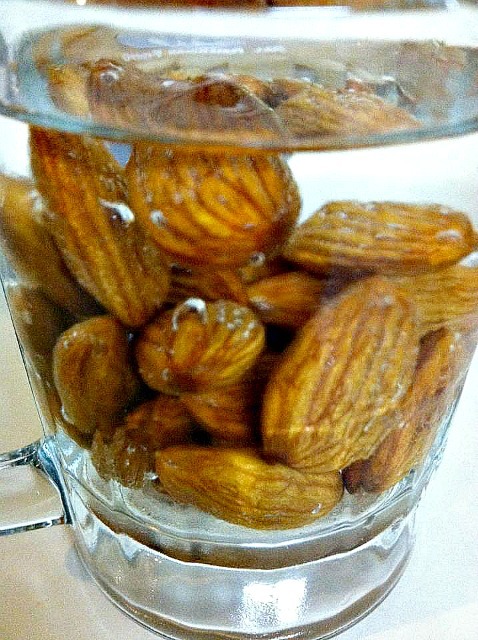 They look and taste similiar to almonds. 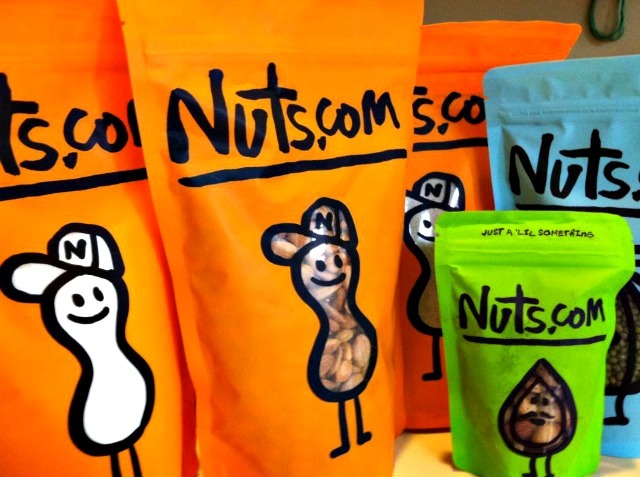 I buy from Nuts.com. They have a great selection of grain free and gluten-free items. I love using shallots. They are even better tasting than regular onions. I made a juice today with 3 organic cucumbers, 2 carrots, 1 small shallot and a 1/2 inch ginger root . 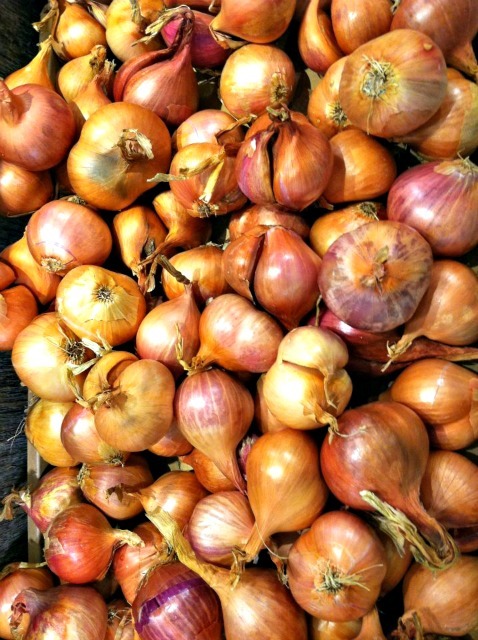 Both garlic and the family of onions can be helpful in lowering blood pressure as well. From vegetable juice to oven omelettes, I use them often. Try some next time you go to the market . 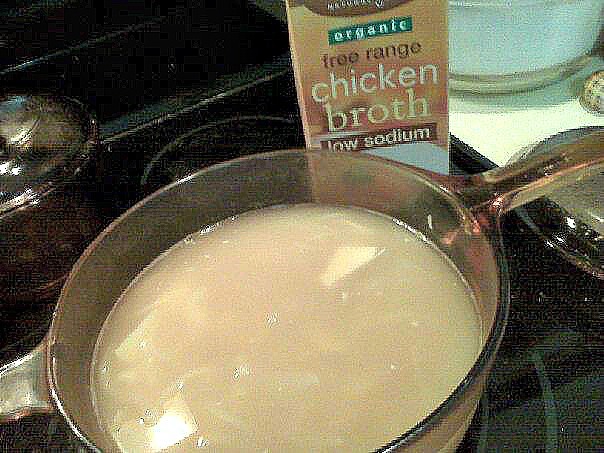 Chicken soup and bone broth are both excellent for minerals and digestion . An essential for Fibro and Osteo conditions. The bones will supply collagen and essential minerals that cannot be obtained in the diet. This mineral rich broth aids in healing a leaky gut and helps with absorption of critical nutrients. And so easy.... The most challenging part might be finding grass fed bones but more butchers/farms are carrying them, including Whole Foods. Simply put one or two grass fed bones in a glass pot, add water to cover, herbs, onions, garlic, seaweed such as kelp or wakame and any cut vegetables you like. 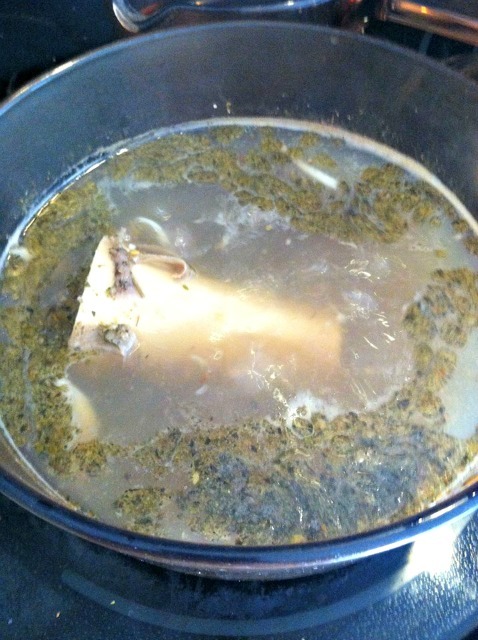 Bring to a boil, reduce heat to simmer and allow the essential minerals from the bones to saturate the broth. Refrigerate and skim off top layer of fat to reheat on stove. Reuse bones 3-4 times. 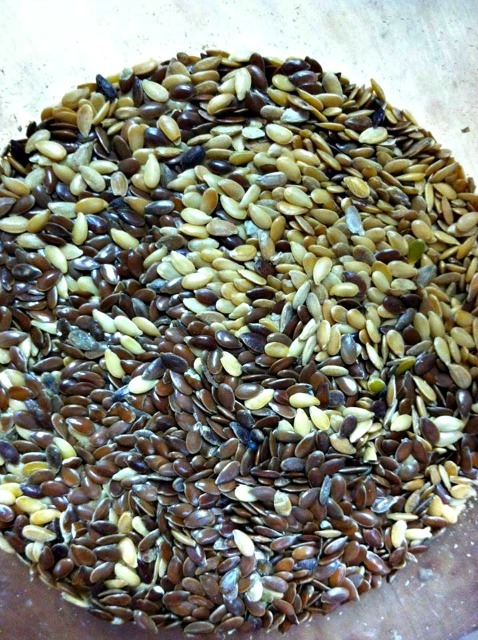 Nothing better for healing leaky gut and deficiency in the body and a gluten-free recipe. 1 inch piece raw ginger root, peeled. 1. 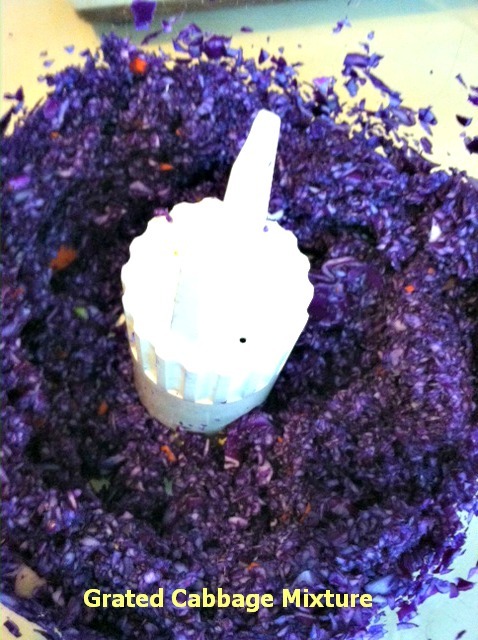 Cut the cabbage into pieces just small enough to fit into a food processor. 2. Add in the carrots, garlic and ginger root. 4. Bring 1 cup of purified water to a light simmer. 5. When water is heated to warm, remove from heat, add in 1 tsp. of coconut crystals or honey AND 1 packet of culture starter. 6. Stir the coconut sugar and cultures, let sit for about 20 minutes while the cultures are awakened. 7. 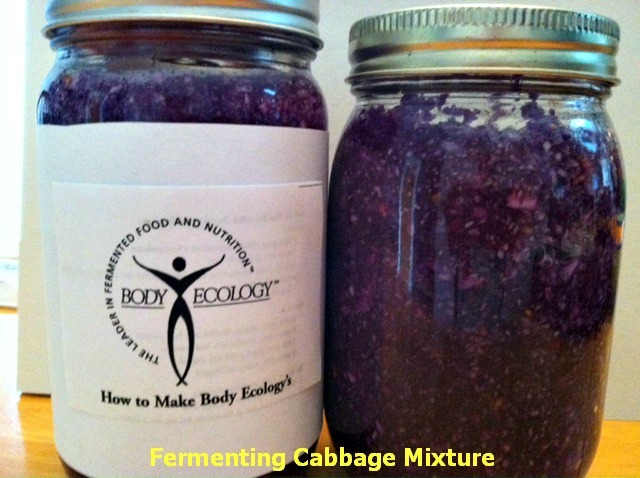 Add the water into the processed cabbage mixture. 8. Transfer this mixture to glass jars with tight fitting lids. This recipe amount should yield about 2 large 32 oz. jars OR four small 16 oz. 10. When the jars are opened, there should be visible fermentation and should taste sour but not spoiled. Note that cultured foods have a strong odor but this is the nature of them and may take some getting used to for some people. After opening, store in refrigerator and use within 4-7 days. Also, 3-4 Tbsp. of the mixture can be used to ferment another 2-3 batches. Remember, there is no life in legumes that have not been germinated. 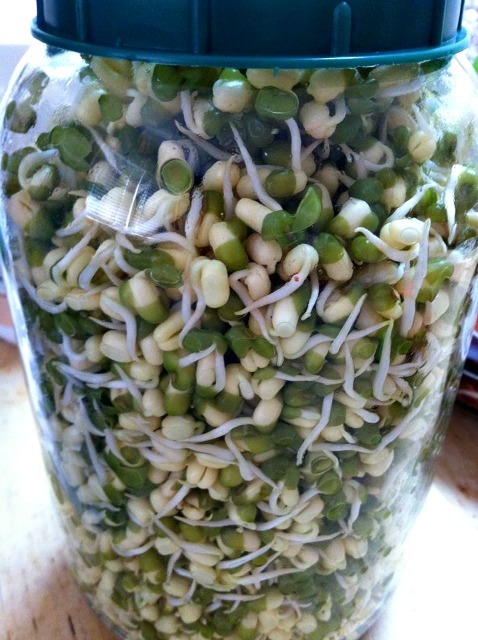 The soaking and sprouting process unleashes the nutrients and protein. Cooked beans are merely starch and acid forming AND hard to digest. Also, a great addition to any blender drink. Great for inflammation, to strengthen hair, and mild liver support. I buy in bulk and mix with other supporting herbs such as ginger and thyme for a heal-thy tea. Avoid the oil or strong infusion of tea if pregnant, otherwise it's very safe. Also a natural insect deterrent. Wrap in a tied cheesecloth with some bay leaves and a spritze of white vinegar in areas where you might see ants or other insects. They don't like the smell and will evacuate nicely!! 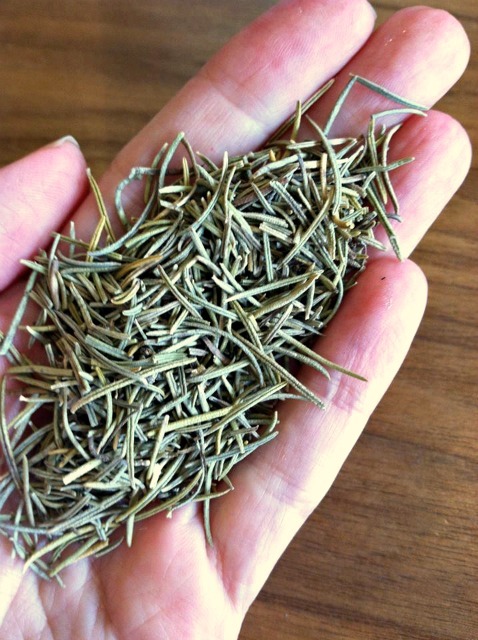 A great gluten-free digestive herb recipe. 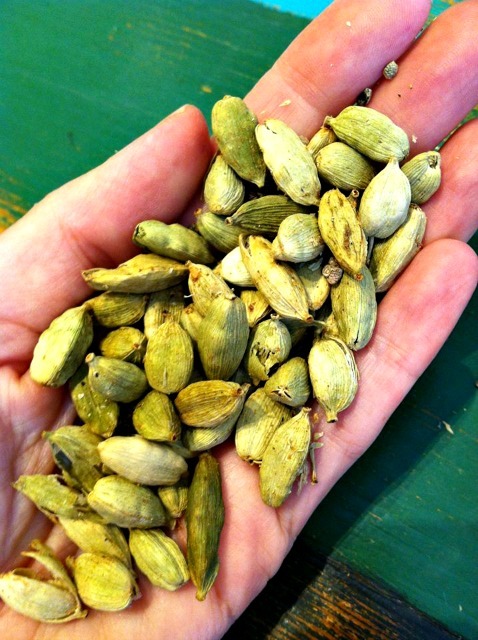 I put Cardamom Pods in the pot when I make tea along with other herbs like fennel, burdock and ginger. Use sparingly, just a few pods is plenty for a pot of tea. A great chaser after the gallbladder tonic I often detail here. 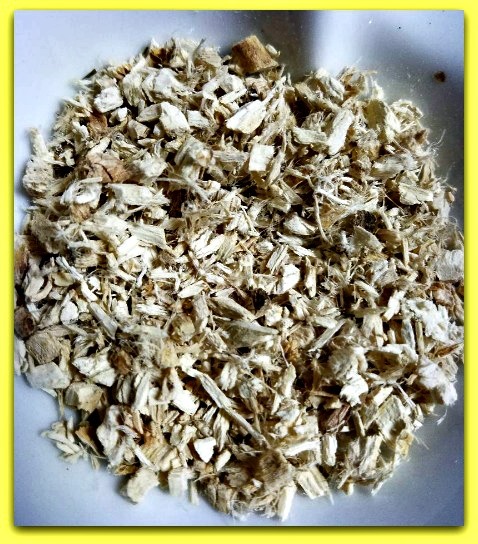 Marshmallow root is excellent for the bladder and GI tract. If you have irritation in your bladder, or have irritable bowel, consider using Marshmallow root tea. I get in bulk form, and steep about 1 tbsp. in about 2 cups of water. I generally mix with other herbs as well. One of my favorite lunch options !! 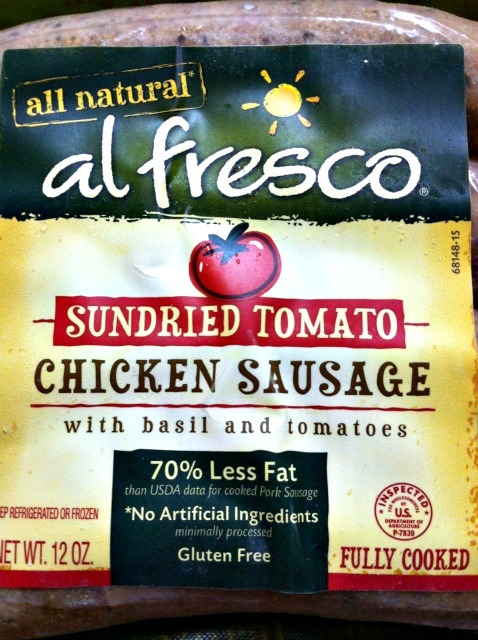 Al Fresco chicken is gluten-free, nitrate and additive free as well. Great taste and fully cooked so its easy to take along and prepare. I buy extra and freeze them. beans and walnuts. It didn't last long!! FAQ: What are the cleanest gluten-free flour mixes available in stores if you don't care to make your own ?? I like and recommend more of the grain free mixes like Simple Mills or Bobs Red Mill. These are more widely available today. These brands leave out MANY of the ingredients that other gluten free brands leave in such as rice flour, corn starch, guar gum, etc. Add in your favorite ingredients and enjoy a great gluten-free recipe. Raw, grain free, gluten-free recipe and delicious!! 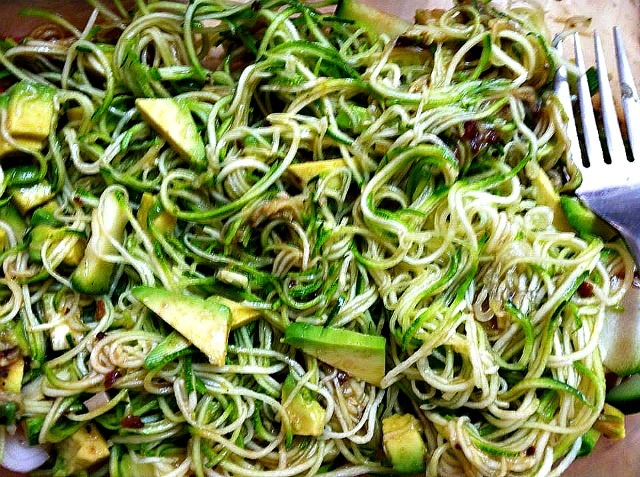 I use a saladaco to spiral raw organic zucchini into angel hair, then simply add avocado triangles, diced shallots, thai flavored spice and sea salt. So many variations and flavors to use with zucchi. 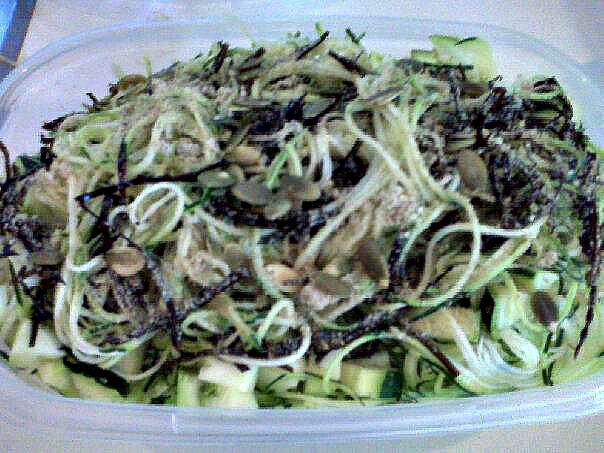 organic zucchini made into angel hair (with the saladaco), I call this one Zucchi, then I add arame', seaweed, pumpkin seeds and ginger dressing ..
For optimal digestion and health benefit, soak raw almonds in pure water about 6-8 hours. Jackets will release easily as well. This removes the enzyme inhibitor to aid digestion and assimilation of raw nutrients. Eat as is or add to blender drinks. Also refer to our Diet for Fibromyalgia page where you can find more options. Remember this is not about specific diets, but more about certain dietary principles. Amazing taste AND texture ! !